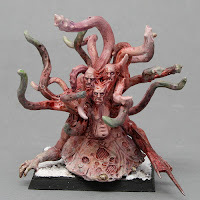 The repaint of the Nurgle spawn went reasonably well. It's still a little bit darker than I really wanted, a couple of glazes too many, but I am sticking with this version. Fully expecting it to be destroyed before it could slither halfway across the board, last night's debut game was almost a success for the Thing. It managed to survive a charge from a unit of Empire knights, then sent them fleeing (with help from some nearby ogres). It then chased and destroyed the knights and was just settling down to a well-deserved nibble on a knight leg, when a last-ditch (turn 6) volley of lead from a unit of handgunners finished it off. Pretty good for a newly painted model, maybe the fresh paint curse is being lifted from my models. Not that I expect the next painted unit to do well. Up next are some chaos hounds, which tend to follow the exact same destiny in every game. Advance, screening troops. Get shot. Lose some (or all) models. Panic. Re-roll panic test. Fail again. Flee, never to rally. I can't remember the last time my hounds tasted blood. For this reason, I will not be spending too long on painting the pathetic little beasts. Bah, I spent a couple of hours today painting the Nurgle spawn, but messed it up. So it will have to be re-primed and re-painted. I think the problem was I only had a vague idea of colours before I started, then kept tinkering until it looked like a vomited rainbow. Not to worry, sometimes these things happen. I have executed my tried and tested plan B - look through some Clint Langley artwork for inspiration. The man is a genius. And I did find the perfect picture to inspire me. I have also been thinking about Space Wolves recently. Space Marines are the biggest thing in the Games Workshop universe, by a long chalk, but I have always struggled to see the appeal. Lots of little robots in Early Learning Centre colours, doesn't really do it for me. So I have had this vague idea to design my own chapter for a while. But the whispers about the Space Wolves I am liking the sound of, maybe I will go that way instead. It will give me a project to keep me busy in winter. I finished painting the marauders today. The technique is very simple, starting with a white primer. The base colours are applied quite thinned down, to give a slight highlight on the raised areas. Then a glaze/wash is applied to add a little shading. A few small areas are picked out for a little extra detail. It's quick and effective and means I can get the unit painted to a good standard with a minimum of fuss. I am really fired up about the chaos troops at the moment. Next up is the chaos spawn and some chaos hounds. That will be three items, two units and a "special" reward model (a reward for painting the rank and file). I was going to switch to another army, to paint three items from that, then another of my armies, to paint three from that one - thus painting three armies three units at a time. But I may well stick to the chaos troops for a while longer. Marauder horse and Khorne warriors are already assembled, plus I could then reward myself with a real big prize - the Khorne lord on juggernaut. After yesterday's abandoned Slaanesh spawn, I decided to have a bash at a Nurgle marked beast instead. 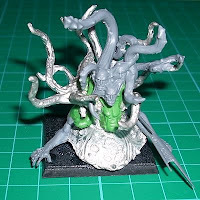 This was a far easier proposition, as I had an old metal spawn model and plenty of tentacles to play with. And here it is, just waiting for the greenstuff to dry before I prime it. I am pretty pleased with it! I wanted to ensure that the model showed that it was, at one time, a human and by sculpting a fairly basic torso onto the metal I think that has been achieved. I spent a couple of hours yesterday putting together a spawn for the chaos army. I wanted it to be possibly marked by Slaanesh, so I used fairly slim and "fast" looking parts, including a flying tyranid minus the wings. When I had finished it, I looked at it and thought about it, and looked at it again and again. Finally, I decided I didn't really like what I saw. So it will probably be tossed aside and I will have a sort through my bits to come up with something else. Better to cut my losses now rather than paint it up and then decide it's not for me. The good news is that the maruaders are coming along nicely. I just need to put a few final details on the unit and decide on what to do with the bases. I am leaning toward a tundra look, if I can work out how to do that.